I'm joining the Hobby Polish Bloggers linkup this month to show off a new Limited Edition (plus some nail art!) from the first indie brand I ever purchased from - Emily de Molly! Technically, I had two firsts because I ordered from both on the same day - Emily de Molly and Alanna Renee, who sadly seems have to disappeared. As much as I would have loved to re-swatch something from Alanna Renee, I have too many untrieds as it is and I was itching to bust out this gorgeous red! This is LE28 (catchy name, yes?) from a recent run of limited edition samples and one offs. This one is now sold out on the Australian site but it looks like it's still available on the US site! 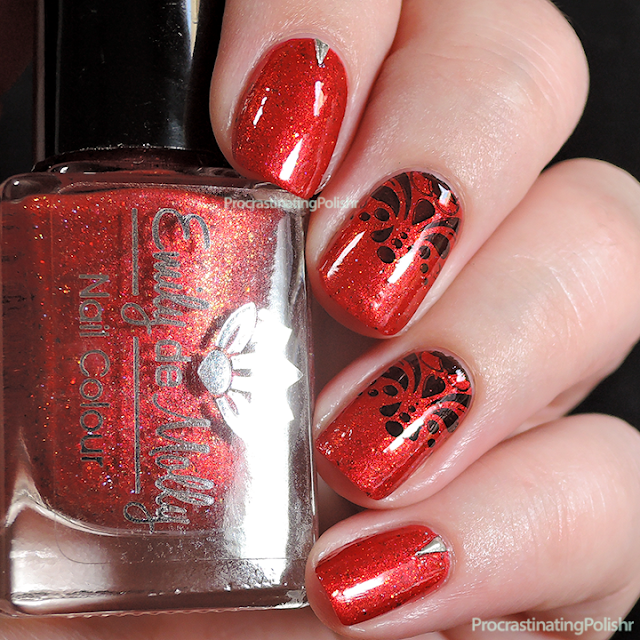 I would highly recommend snapping it up if you like reds because this one is stunning! 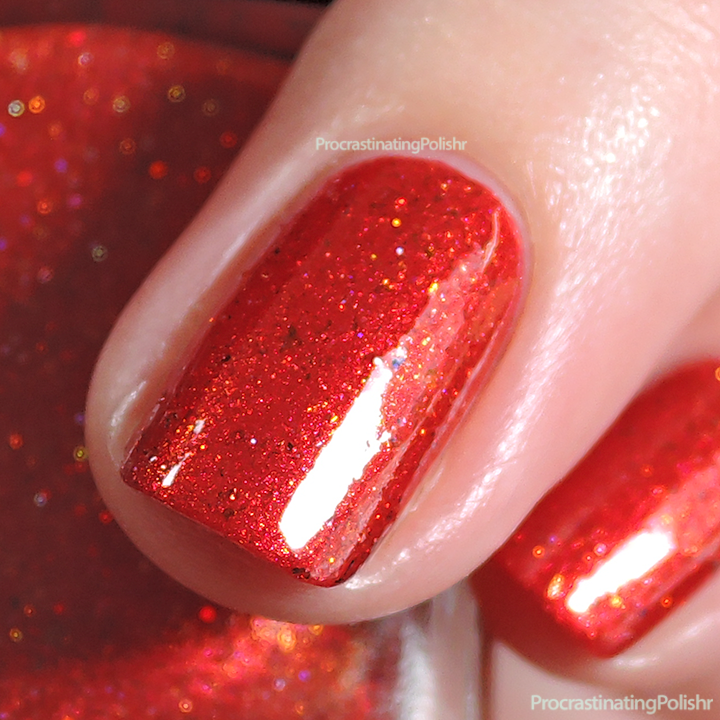 It's a fully loaded red shimmer packed with tiny flakies and copper microglitter. It's almost a one coater, but I did two just to be sure there was no VNL in photos. 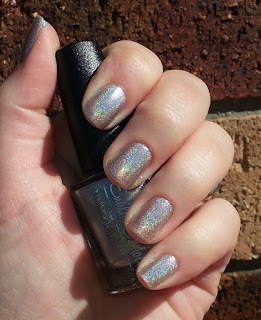 Plus, a little more shimmer and flakies never hurt anyone, right? Of course I couldn't stop at just a swatch when there are also so many gorgeous EdM stamping plates to choose from, so I added some accents with plate EDM01 and some tiny narrow triangle studs that I don't think they stock anymore. Now, because I love and trust you guys, here is my first ever photographed nail polish swatch from April 2013 with Emily de Molly Inevitable. This photo makes me seriously cringe!!! Make sure you take a look at all the other firsts in the links below!